Buddy Whittington has some of the hottest blues chops we've ever seen - and luckily for you, he's also a decent enough bloke to share 'em. In this video lesson Buddy talks you through several licks - we've tabbed five of the best. After you've watched the video below, jump to page two to get the tab. 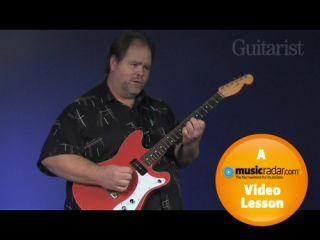 Buddy Whittington's speedy lick works with typically bluesy ambiguity, starting in the area of A minor pentatonic, shape 1, before moving down to an area associated with A major pentatonic, shape 5. Don't hurt yourself playing this one! The four-fret bends in this little Albert King tribute will take some practice, so work up to them gradually. Albert King was left-handed and played a standard right-handed Flying V upside-down, he made those huge bends by pulling downwards. If you want to stretch your blues playing in new directions, try looking into the fertile ground between blues and jazz. The VI-II-V-I progression follows the cycle of fifths and, although it's a simple concept, it can sound very sophisticated. Another way of expanding your blues playing is to learn some new turnarounds. The turnaround is the series of chords that signals the end of the chord progression (and usually the start of a new verse). They're often interchangeable so you can easily spice up a familiar old song.